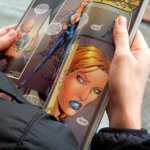 The first Saturday of May is Free Comic Book Day in the USA. This an annual promo effort by the North American comic book industry aimed to find new readers and attract them to comic book stores. Free Comic Book Day was initiated by comic book sellers. The day was observed for the first time in 2002, coordinated by Diamond Comic Distributors, the industry's single large distributor. Almost each year Free Comic Book Day is associated with a film's opening. The very first observation of this day was associated with Spider-Man, during next years other movies were involved: Iron Man, Thor, X-Men Origins, The Avengers. Free Comic Book Day has 3 main goals. This day is a great opportunity to introduce everyone to the joys of reading comic books, call back former readers and thank current buyers for their continued support. Every year publishers produce special editions to attract new non-comic readers. Everyone can find a comic book to his or her liking: super-heroes, traditional comics fare, manga and works of independent publishers.